In an age when many cradle Christians are indifferent to entering a church, believing that it is a space equal to any other in which to commune with God; in a time when many who consider themselves "spiritual but not religious," disdain churches as incapable of inspiring their spiritual quest, I would like to offer some reflections on Orthodox churches, icons and liturgy and the power that they can hold. These reflections describe how churches can affect individuals with a power apart from them. Karl Rahner, the German Catholic theologian, spoke of the modern phenomenon of the dichotomy between the sacred and the profane, and how the culture does not see all of life as imbued with God's grace in a sacramental way. But it seems, at least outside of Orthodoxy, that there is a perception that sacred space has been absorbed into the profane, leading to a cynical attitude that life can hold no mystery because it is limited to only what our minds can grasp. In his Confessions, St. Augustine of Hippo explained that after his baptism on Pascha in April of 387, he often was moved deeply at the liturgy. As a later commentator wrote, "After that Holy Saturday, days of infinite sweetness began. Taking part in the liturgy moved him to tears. He cried not because he was in distress, but because he could finally breathe." My own experiences of Orthodox liturgy have given me a sense of being home. And at times, during the months before I was chrismated, I would suddenly and inexplicably be moved to tears. I spent days, sometimes weeks of reflection and discussion with my spiritual father to attempt to understand with my mind what I was feeling in my deepest self. Some of it was sadness, but intermingled with a sense of forgiveness, relief and hope. I felt I was resting in the hand of God. Through my reading I discovered the accounts that I have described above, which are so striking in their similarities to my own. Having lived almost all of my life as a Catholic, in the time before the Second Vatican Council changed the Catholic liturgy from Latin to the vernacular, I know something of an interior experience of the liturgy. Although I did not resist the changes, I was more than comfortable with worshiping in Latin; and found a measure of peace in these experiences. But nothing really prepared me for the dynamis of the Orthodox liturgy; its ability through grace to move the believer from one kind of existence to another. A few weeks after I was chrismated at St. George Tropeoforos Greek Orthodox, I visited the Russian Orthodox Cathedral St. Nicholas for the vigil one Saturday evening. Recently restored, St. Nicholas is an architectural symbol and living spiritual witness to more than 1000 years of Russian Orthodoxy. It is now headed by Bishop Mercurius, Bishop of Zaraisk, administrator of the US parishes of the Moscow Patriarchate. The feeling I had upon entering the Cathedral was one of space and openness. Standing in that space invites a kind of active and communal prayer, lacking pews which could put barriers between yourself and others and in a sense to isolate and hide yourself in prayer. That choice is impossible. Two or three benches are placed in the back and on one side wall for the elderly and children. Everyone who enters the cathedral must be active, even if only by standing and gazing at the beauty surrounding you. When I stood in the middle of the expansive space with its soaring dome of Christ the Pantocrator gazing down, its gleaming wood floors and several shining candelabras, its enormous icons on the walls and splendid iconostasis, I was struck dumb. Even if I could have spoken Russian, which I think all of the congregation speaks, I wouldn't have been able to say anything. I purchased candles and approached an icon of Christ and another of a modern woman saint who was pale, in a scarf and plain dress. I didn't know who she was, but the look in her eyes was of suffering and compassion at the same time. Vigil began; the choir sang and a deacon opened the left door, turned toward the iconostasis with arm raised and chanted in a deep bass voice. All was in Slavonic. The congregation of young and old, men, women and children crossed themselves, bowed, and many prostrated themselves, touching their foreheads to the floor. I noticed one young man, especially, tall and slender who found a place along the wall to pray and prostrate. The only time I had ever seen anyone assume such a position in the Catholic church was at the ordination of priests when the men lay prone on the floor in the sanctuary. It was powerful to observe then, and was no less powerful now. I crossed myself and bowed until my shoulder ached, but I did not prostrate. I was not prepared for that yet. While this activity unfolded, I noticed an older woman in a black scarf which covered her head and forehead, black skirt and blouse and glasses tending to the candles -- removing the ones almost burned away and placing them in a little bucket. She appeared to have dropped from another century and a land far away. Then I noticed other women who either maintained the candles or cleaned the icon glass which the worshipers kissed. They were young or middle aged and stylishly dressed. Some wore pants, but all had their head covered with a hat or scarf. They seemed quite comfortable crossing the line that our American culture has established between modernity and tradition and between the sacred and the profane. For them, there did not seem to be a division, but a co-existence, or perhaps an organic integration of both into their lives. The choir was both ethereal, with women's voicing floating above, and densely rich from the grounding of male voices. The music seemed more "call and response" than accompaniment or interjection to the prayers and chants of the clergy. Periodically, a chorus of male voices penetrated from behind the iconostasis, and much later I realized that the chorus was formed by the bishop, priests and deacons. At the end of the service, someone who I surmised was the bishop because of his crown, stood on the Ambo and anointed everyone with oil, using a brush from a golden cup. I went to the end of the line, watched everyone carefully, and received the anointing. I left the vigil feeling jubilant and tranquil at the same time. I returned again at the feast of the Veneration of the Cross which coincided with the visit of the Tikhvin Icon. 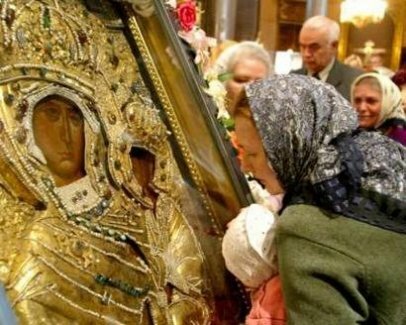 The ancient and much loved icon was on its way back to Russia and its home in the Dormition Cathedral in the Tikhvin Monastery after a stay of 55 years in the US. The line inside the church, five or six people wide, wound from the front of the church around to the opposite side. People waited silently to venerate the ancient and miraculous icon, left flowers, and many wept. The tradition of the Tikhvin icon goes back 2,000 years and many miracles ago and much history and change. She seemed to embody within her ancient tempura, jewels and precious metal, the faith and hope of the people who expect her to be with them in their suffering and in their joy. While the icon was being venerated, the vigil proceeded for the Veneration of the Cross. Every liturgical feast was new to me, so I was not prepared for what occurred. I had no idea what was being sung or said, but not knowing the language has the advantage of forcing one to glean information through other venues. This time I noticed a rhythm to the service for the first time. There was an interchange between the chanting, singing and reading by the deacons and priests and their movements in and out of the iconostasis to pray, read and cense the icons and the congregation. The entire church was packed with people, not only those for the Tikhvin icon, but for the vigil as well. Almost everyone who were there for the vigil was prostrating throughout the liturgy. I was in the front, surrounded by prostrating worshipers, I could not avoid it, nor did I want to. When Bishop Mercurius lifted the cross surrounded by flowers on his head and processed into the nave, I could feel the liturgy moving to a climax. He, together with the clergy and all the people, prostrated themselves before the cross. The music swelled during the prostrations, and I wept. My forehead was on the floor, my spirit was bowed but soared within me, and I wept. I was everywhere and nowhere simultaneously. I was in this world and somehow transcending it. And after almost two hours of standing and crossing and bowing, I became tranquil and at rest inside myself. My prayers for what to do and where to go were met with a quiet answer: be nothing, stop striving, to rest in God. Standing in prayer in St. Nicholas Cathedral reminded me of the dance. With all its elements, it binds the human with the divine, provides us with the opportunity to dance with God. Later this notion took on even more meaning when I read these words of Thomas Merton: "No despair of ours can alter the reality of things, or stain the joy of the cosmic dance which is always there. Indeed, we are in the midst of it, and it is in the midst of us, for it beats in our very blood, whether we want it to or not. Yet the fact remains that we are invited to forget ourselves on purpose, cast our awful solemnity to the winds and join in the general dance." that we may receive the King of all. Mary Ward has taught at Fordham University in New York City since 1995 as an adjunct professor and has lectured at American Academy of Religion conferences and at colleges and parishes.